If you want to shoot comfortably and end up with your sharpest images possible, it's worth thinking about how you're holding your camera. You may think the way to hold it is obvious, and for everyday shooting there's a good chance you're doing nothing wrong. Nevertheless, there are a few things you may not have considered that can help you to shoot that little bit better, particularly in colder conditions or when you need to rely on slower shutter speeds. 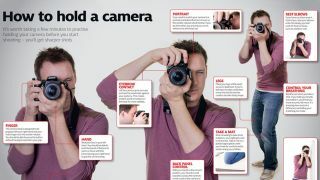 How should you hold a camera? How you hold a camera depends on the type of camera you're using – and in the case of interchangeable-lens cameras, the type of lens you use too. Here, we're assuming you're using a standard DSLR with a conventional autofocus lens, such as the 18-55mm type that would typically come with the camera. First, you should think about whether you can operate it comfortably in the way that you need to. You shouldn't need to keep repositioning your right hand every time you want to capture an image, as you should just be able to move your fingers to regulate controls. The zoom ring on your lens should also be within easy reach of your thumb and finger. It's possible that the position of your legs and feet may also not provide you with the best support, particularly when standing for extended periods of time. Moving one leg slightly in front of the other, rather than having both feet right next to each other, may help you to be more stable. You should also pay attention to where your camera is relative to your face. You may be simply bringing the camera close to your eye, but moving it back so that your viewfinder's eyecup rests against your eyebrow will provide an additional contact point for greater stability. Tucking your elbows into your body can also help to keep you steady. Sometimes you may need to get extra stable for those situations when you don't have a tripod. Here, you can kneel on one knee and rest your elbow on the other one, essentially turning your body into a tripod. This will also give you extra stability than if you were to just kneel on both knees. You can also use a mat if it's more comfortable. This doesn't need to be anything special or particularly large; you may already own one that would be perfectly suitable, such as a garden kneeling pad.